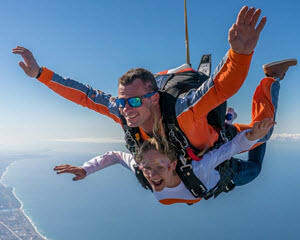 Tandem Skydiving is the fastest and easiest way to experience the excitement of freefall skydiving, life's ultimate thrill. 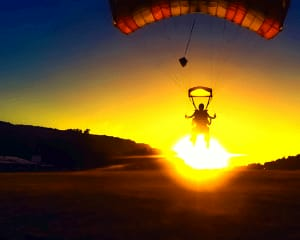 You will be attached to the front of an experienced Tandem Jump Master and encounter the awesome sensation of a tandem skydive. 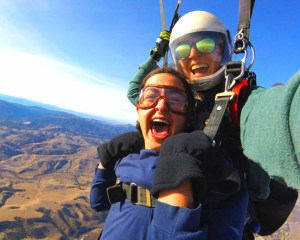 All the thrills without the intensive training or responsibility of opening your own parachute. You'll begin your adventure by being kitted out in a jump suit. Following this, is a simple ground briefing including a few 'dirt dives' (a practice exit from a mock-up plane) along with an overview of canopy control and landing procedures. You then climb into the plane, take-off and begin the twenty-minute climb to an altitude of between 9, 000 - 18,000 ft, depending which skydiving school you attend. When you reach this point, a final systems check is carried out. You have now reached the point of no return. The only way down is to jump! Nothing can prepare you for the sensation of stepping into the sky. 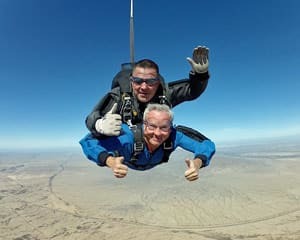 As the adrenaline rush kicks in, you'll feel like you're floating on a cushion of air for 60 seconds as you travel at over 120 mph in a 8,000ft freefall. The wind rushes into your face and the heart is racing. If you are having your jump videoed, a cameraman will appear as if from no where and station himself in front of you to capture the excitement forever. At about 5,000ft the parachute is deployed. The silence is amazing, the view sensational and during the 5-minute descent you will be taught how to fly the parachute to a gentle landing. 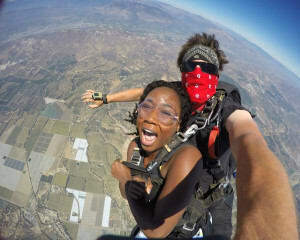 Skydiving is one of life's greatest adventures. The feeling is indescribable, and the buzz lasts for weeks. 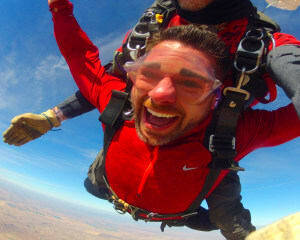 Learning skydiving is a must for those who love to fly! 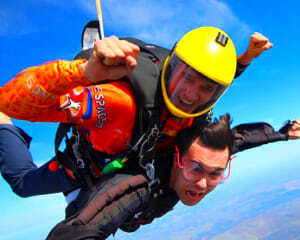 If you just want a taste of being a skydiver, a tandem skydive is the way to go!